In plan evaluation, metrics such as volume of normal lung irradiated by 20 Gy (V20) present an incomplete view of the dose falloff to the normal tissue. R50% and D2cm were used to assess the intermediate-to-low dose spillage outside the PTV. HDloc was recommended to evaluate the high-dose (>105%) spill outside the PTV. However, both R50% and D2cm could include regions outside the lung tissue or ribs that may not have known dose tolerance or clinical end-points. Conversely, D2cm is estimated isotropically at 2 cm distance from PTV surface without taking water equivalent path length into account. In this study, we have identified a trend in the R50% and D2cm data questioning their independence that is worth exploring. In addition, neither of these metrics could correlate with the excessive toxicity observed when treating central lung tumors using SBRT. In this study, we propose to study the normal tissue toxicity using exponential dose falloff gradient (DFG) that can be directly related to the normal lung volume irradiated. To study the impact of planning techniques on the dose falloff, plans with alternate coplanar/noncoplanar arc configuration and alternate photon energy were also utilized. This study was approved by the institutional review board. Forty-one lung tumor patients previously treated with VMAT-based SBRT were included in this study. Four-dimensional computed tomography (4D-CT) scanning was performed in GE-Discovery CT scanner (GE Medical Systems, Waukesha, WI, USA) and CT images were reconstructed at 2 mm slice spacing. The 4D-CT image data were sorted into 10 phase bins ranging from 0% to 90% with 0% phase being end-inspiration and 90% phase end-expiration. The maximum intensity projection images were used in generating an internal target volume (ITV). ITV is grown into PTV anisotropically using 10, 5, and 5 mm margins along longitudinal, lateral, and anterior-posterior axes, respectively. [Table 1] shows the patient statistics. 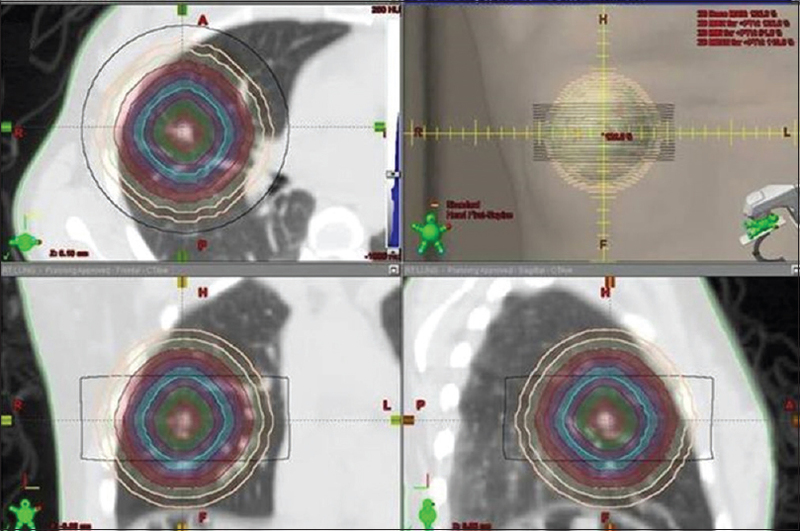 VMAT-based SBRT plan was calculated on the respiration-averaged CT of the ten phases of 4D-CT using Acuros XB dose calculation algorithm on Eclipse treatment planning software version 11.0 (Varian Medical System, Palo Alto, CA, USA). RapidArc technique was used for delivery on either a Novalis Tx or a TrueBeam ™ STx equipped with high-definition multileaf collimators. SBRT plans were created using either 2 or 3 complete or partial arcs based on 6MV, 6 MV-FFF, 10 MV, or 10 MV-FFF energies. Coplanar or noncoplanar field configuration with up to ± 15° couch rotation was generated. Plans were normalized such that 95% of PTV received the prescription dose (Rx) of 48–55 Gy. Among the 41 clinical plans, 35 plans involved couch rotations ranging between 0° and 30° with a mean ± standard deviation (SD) of 16.1° ± 9.8°. Dose constraints to the OARs include maximum point dose of 18 Gy to spinal cord, 30 Gy to heart, 24 Gy to brachial plexus, 30 Gy to trachea, and a mean dose of 27 Gy to esophagus as well as maximum percent V20 of 15%. Dose calculation grid size was set at 2 mm for SBRT at our institution. 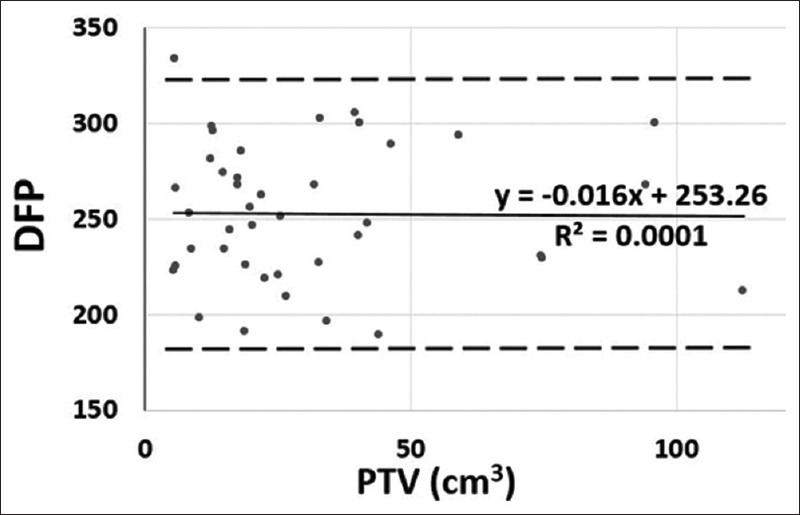 A phantom study was contrived to (a) study the asymmetrical spread in spatial dose distribution around the lung tumor number and (b) identify the optimum width of rings outside the PTV for dose falloff calculations. While the former is intended to address the predominantly coplanar dose distribution due to large fraction of coplanar beams in our clinical plans, the latter facilitates dose evaluation outside PTV in a lung SBRT plan. The steep dose falloff along the longitudinal axis was known to skew the spatial dose distribution and a “ring terminator” region can be considered similar to setting a low-dose threshold. The longitudinal and lateral extents of the “ring terminator” region are identified using linear dose profile measurement. While thin rings may explore dose falloff accurately, they could be impaired by noise fluctuations. On the other hand, wider rings may suffer from low spatial resolution. The slope of mean and maximum dose falloffs and the rate of change of slope that corresponds to curvature were computed. These measurements were compared for the four ring sizes considered here, 2.5 mm, 5 mm, 7.5 mm, and 10 mm width. A thorax phantom (Model 002 LFC; CIRS Inc., Norfolk, VA, USA) with spherical lung lesions varying between 5, 10, 20, 40, and 80 cm3 was used in this study. A VMAT SBRT plan was created for each target meeting the clinical dose coverage. The target coverage, dose conformity, and mean and maximum dose in the rings were evaluated in addition to the proposed metric, DFG. Radiation Therapy Oncology Group (RTOG) report #0915 treatment plan quality metrics include the conformity index (CI) of the target coverage which is defined as the ratio of prescription isodose volume to the volume of PTV. Dose homogeneity index (HI) within the target can be estimated using the ratio of differences between the doses delivered to 2% and 98% of volume with the median dose to the PTV, which was originally proposed in ICRU-83. For estimation of dose falloff outside the target, RTOG recommended metrics evaluated include R50%, D2cm, and HDloc. D2cm is defined as the maximum dose (in % of prescribed dose) at a point 2 cm away from the surface of PTV along any direction. For estimation of high-dose spillage (HDloc), volume of 105% isodose volume outside the PTV is estimated as a ratio of the volume of PTV. Published tables provide desirable range of values for these metrics. Dose falloff product (DFP) defined as the product of D2cm and R50% was introduced to study the dependence of the two metrics (D2cm and R50%) on one another by investigating the relationship between DFP and PTV. An SBRT plan of high quality would have low values for R50%, D2cm, HDloc as well as DFP. where A1, a1, A2, and a2 refer to fitting coefficients and %DD (r) denotes the dose as a percent of the Rx at a radial distance r (mm) from PTV. Value of the coefficients was obtained using the statistics toolbox in Matlab ver R2016a (The Mathworks, Inc., Natick, MA, USA). The first and second terms in Equation 5 represents steep and shallow exponential dose falloff. Notice that as r approaches 0, the first term dominates and as r approaches large clinical distances, the second term dominates. By definition, steep DFG is numerically equal to a1 and the shallow DFG is a2. A large DFG implies fast dose falloff outside PTV and less volume of normal lung tissue irradiation which holds significance in our study. The relationship between DFG and the 50% isodose volume irradiating the normal lung (outside PTV and not including the chest wall or ribs) is studied on the patient plans. The aim of the alternate planning strategies was to study any reduction in dose to normal tissue in addition to improved RTOG metrics. Alternate research plans utilize two strategies. In the first method, all noncoplanar beams were changed to coplanar beams, and dose was computed after plan optimization for coplanar beam arrangement. This would test the hypothesis that the altered footprint of radiation passing through the patient's body would change the low and intermediate dose levels. Papiez et al. had postulated steep dose falloff from multiple noncoplanar, nondivergent beams in extracranial stereotactic radioablation. While the authors attempted to “imitate” Gamma Knife treatments using linear accelerator for extracranial sites, there was limited clinical feasibility. The use of FFF beams with cone-shaped profile could alter the dose statistics including RTOG metrics, dose to OARs in a lung SBRT plan besides reduced treatment time. In the second alternate planning strategy, photon energy of 6MV was replaced by 6 MV-FFF and vice versa. Likewise, 10 MV photon beam was replaced by 10 MV-FFF and vice versa. DVH-based statistics from the two alternate plans were compared against DVH of the clinical plan. Plans were evaluated according to the following parameters: CI, R50%, D2cm, HDloc, DFG, and dose to OARs. The dose statistics from the alternate plans were compared to the clinical plan. Test for normal distribution was performed using Shapiro-Wilk test in R statistical software ver 3.2.0 (R Development Core Team). Statistical significance was tested using a paired Student's t-test for normally distributed data and a Wilcoxon signed-rank test, otherwise with a threshold P = 0.05. Clinical plan metrics met the RTOG reports 0813, 0915 guidelines tabulated in [Table 2]. The CI values have an average of 1.1 (range: 0.99–1.24) which is close to the value of 1.2 for acceptable plan. Based on PTV, the plans should have R50% values <3.2–5.3 for an acceptable plan and <4.2–6.3 for a plan with minor deviation. The observed values of D2cm ranged within 43.0%–74.1% and are well within the range of an acceptable plan or a plan with minor deviation. An ideal plan should have values of HDloc <0.15 which was observed in all the patient plans. The mean ± SD of DFP was 253 ± 36 for the patient plans. [Figure 1] shows the relationship of DFP and PTV with a slope of −0.016 and R 2 of 10−4. Such a small value of slope implies a negligible change in DFP with PTVs observed in lung tumor patients treated with SBRT at our institution. This indicates that DFP is independent of PTV which implies that D2cm and R50% may not be independent of each other. A thorax phantom plan with multiple rings outside the PTV and the ring terminator region is displayed in [Figure 2]. Linear dose profiles outlined in [Figure 3] confirms a steeper dose falloff along the longitudinal axis than along a lateral side of the phantom. [Figure 3] also confirms that dose drops off to <10% of Rx dose at distances of 1 cm along the longitudinal and 4 cm along the lateral direction from the PTV surface. These were considered as extents of the “ring terminator” region, and dose outside this region could be neglected without an impact on the dose statistics. [Figure 4] displays the rate of change of slope of the maximum dose (measured in cGy/mm2) for the 4 ring widths considered. The huge fluctuations in rate of change in slope observed in 2.5 mm ring data hinder their usage. 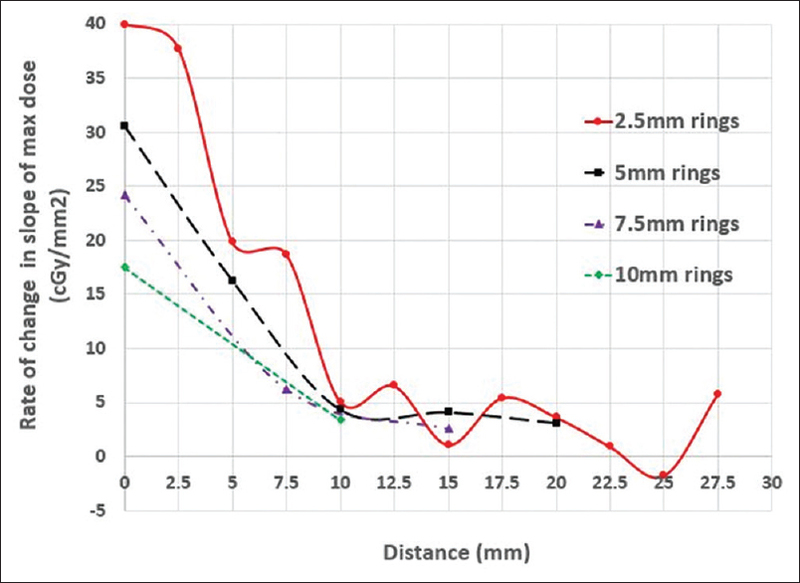 With low spatial resolution, the 7.5 mm and 10 mm rings fail to capture the trend or curvature of dose falloff outside the PTV. In addition, the number of rings has to be sufficient to study the dose falloff down to <10% of Rx dose. An optimum choice was determined to be 7 rings of 5 mm width. 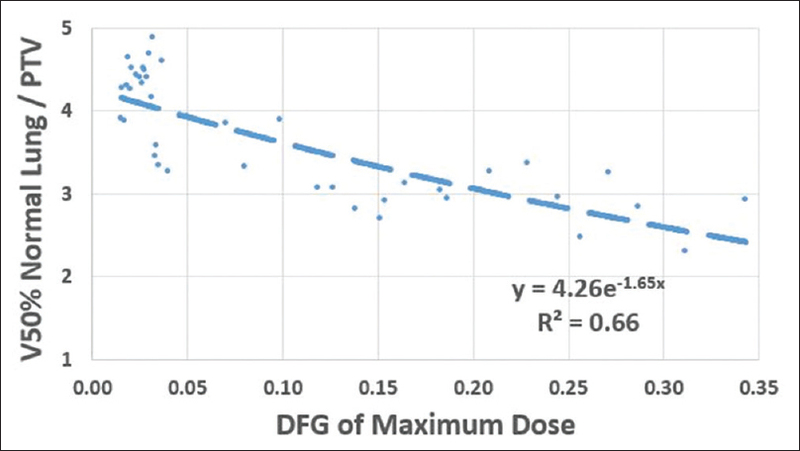 [Figure 5] shows the maximum and mean dose falloff as well as DFG for 100% target coverage. It can be noticed that the values of steep DFG (a1) are larger than the slow DFG (a2) by one order of magnitude and the slow dose falloff term can be replaced by a constant for distances of clinical interest. Notice that although DFG of maximum doses decrease with increasing PTV, there is no such trend in the DFG of mean doses with PTV. DFG of the maximum dose was hypothesized to have a trend with the intermediate-to-low isodose volumes. The 50% Rx isodose volume has been observed to decrease with PTV and expected to be lower in a plan with higher DFG. By normalizing with the PTV, the volume of normal lung irradiated by 50% isodose volume (VNL50%) has been evaluated against DFG. 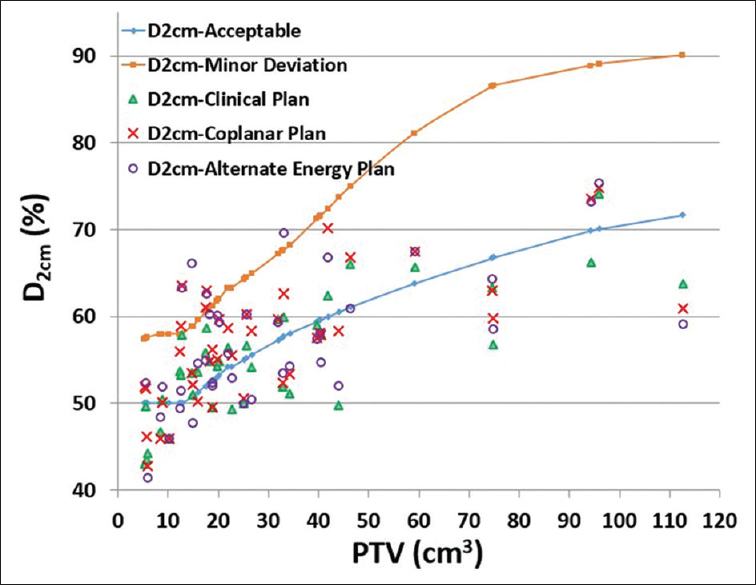 [Figure 7] displays exponentially decreasing relation of VNL50% normalized to PTV with DFG of maximum dose. Note that VNL50% is calculated from the intersection of bilateral lungs with 50% isodose volume and could be extended to estimate V20 or mean lung dose. However, R50% calculation could include chest wall, ribs, and other organs outside the lungs. The alternate plans were reoptimized to meet the target coverage and OAR dose constraints. Barring R50% of one clinical plan, the values of both D2cm and R50% of all the clinical plans can be considered acceptable or with minor deviation, as shown in [Figure 8] and [Figure 9], respectively. Among the coplanar plans, 4 and 5 patients had major deviations in D2cm and R50%, respectively. Corresponding numbers for alternate energy plans were 4 and 7 patients. None of these metrics (CI, HI, HDloc, D2cm, and R50%) of the alternate plans displayed significant differences with the clinical plans at 5% threshold. The analysis of SBRT plans of lung tumor showed that R50% and D2cm were, respectively, decreasing and increasing with PTV. Similar values of R50% and D2cm were reported by a phase III multicenter randomized trial (ROSEL) on Stage 1A lung cancer. To the best of our knowledge, this is the first study which revealed that the product of these two metrics, DFP has slowly varying value which questions the complete independence of R50% and D2cm. This study questions the need to have two metrics when either one could perform this job equally well. It is evident from [Figure 8] and [Figure 9] that RTOG constraints on D2cm can be easier to meet than those of R50%, thereby suggesting that R50% is possibly a superior metric. 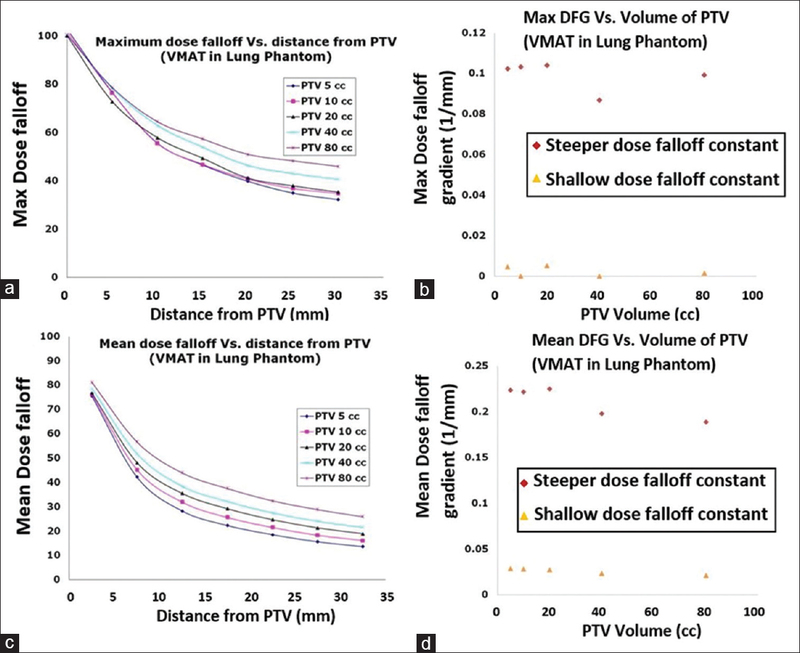 In this study, the dose falloff outside PTV in lung SBRT plans that take the spatial dose distribution was taken into account. Our analysis shows that asymmetric dose distribution, possibly due to beam arrangement or avoidance structures, can be quantified by DFG derived from Equation 5. The contrasting dose falloff along axial and longitudinal axes illustrated in [Figure 3] agrees with similar results from an extracranial SBRT study. The authors studied the isotropicity of dose distribution and gradient of dose falloff in regions adjacent and away from the tumor boundary. 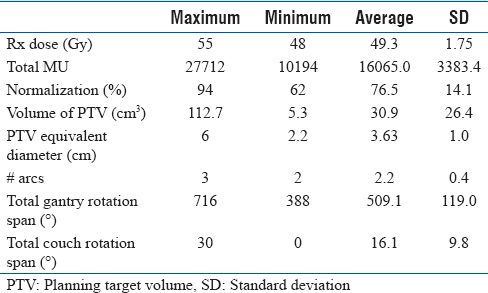 For a target with significant longitudinal movement seen in lung tumors, this dose distribution presents a potential risk of marginal miss, especially when small PTV margins are used. Equation 5 is a fitting function for the dose distribution in the region outside PTV. For the 41 plans studied here, V50% of normal lung normalized by the PTV was found to decrease exponentially with DFG of maximum dose. From a known DFG, one can estimate VNL50% or any intermediate dose including, V20. Thus, DFG can be used as a surrogate of normal lung irradiation with high DFG symbolizing low percent of normal lung irradiated by intermediate dose, as shown in [Figure 7]. Although not considered during plan optimization, the radial dose dependence dropoff measured by DFG can be used as a complementary measure. Alternate treatment plans were created to study the effect of beam arrangement and beam energy on dose reduction to normal tissue. In a 37 lung cancer patient SBRT study, Lim et al. found that multiple noncoplanar static fields produce significantly lower R50% than multiple coplanar static fields or VMAT. In a retrospective study on 15 lung cancer patients, VMAT plans scored substantially better RTOG metrics than 3D plans, and noncoplanar VMAT plans were slightly better than coplanar VMAT plans. 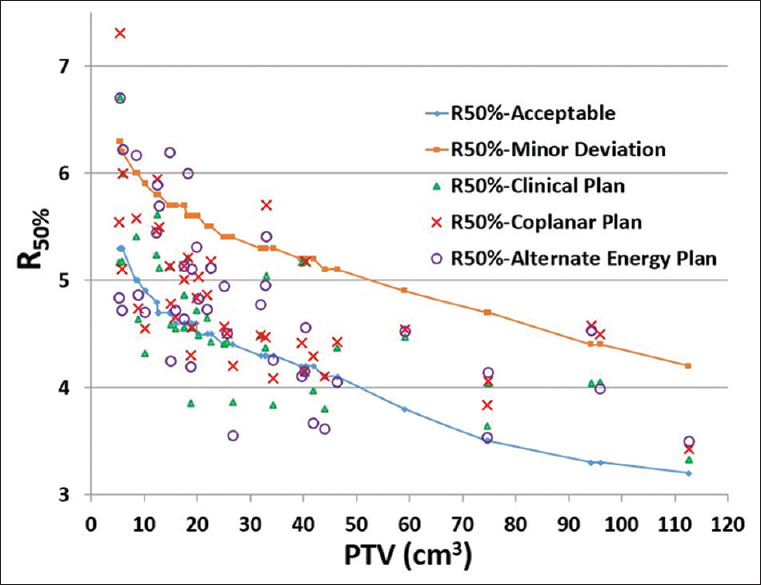 In our study, 4 and 5 coplanar plans had a major deviations in D2cm and R50%, respectively, while the corresponding numbers were 1 and 0 in noncoplanar plans. However, a significant gain in dose to OARs or RTOG metrics was not observed in our study using noncoplanar arcs (P > 0.1 in Wilcoxon signed-rank test). Possible explanations could be the amount of noncoplanarity from about ± 15° couch angle limitation due to collision issues and lack of statistical power. It is feasible to achieve better results on lateral tumors and smaller sized patients where the couch angle could be larger. The main advantage of noncoplanar arc and FFF beams is the ability to spare critical organs with additional degrees of freedom., Zhang et al. had demonstrated slightly better RTOG metrics for noncoplanar VMAT plans with FFF beams than their flattened counterpart beams, with the exception of number of monitor units. Higher MUs in FFF beams does not necessarily imply large peripheral doses due to lower head leakage with the absence of flattening filter. In fact, when treating with FFF-VMAT plan, the percent of normal lung exceeding 5 Gy and 20 Gy (V5 and V20, respectively) were lower, both of which were correlated to pneumonitis. The dose rate of FFF beams is substantially higher than conventional beams leading to lower treatment time and less chances of patient motion. In a 132 lung cancer patient study, Navarria et al. had concluded that SBRT with FFF beams permitted safe delivery of high dose per fraction in a short treatment time resulting in an earlier radiological response compared with FF beams. 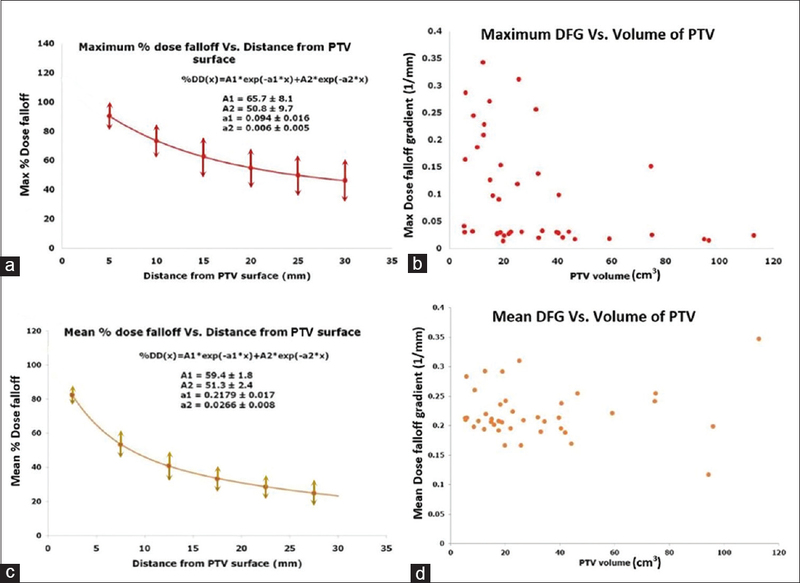 An exponential fit function was attempted to study the dose distribution outside the PTV from which dose falloff coefficients, namely, DFG were extracted. This new variable was used to evaluate dose to the normal tissue outside the PTV and could act as an SBRT DFG in addition to other metrics. In addition, DFG could be used to predict the percent of normal lung receiving medium-to-intermediate dose. The independence of RTOG recommended metrics, R50%, and D2cm was found to be questionable, although further research is required for conclusive evidence. Brock J, Bedford J, Partridge M, McDonald F, Ashley S, McNair HA, et al. Optimising stereotactic body radiotherapy for non-small cell lung cancer with volumetric intensity-modulated arc therapy – A planning study. Clin Oncol (R Coll Radiol) 2012;24:68-75. Holt A, van Vliet-Vroegindeweij C, Mans A, Belderbos JS, Damen EM. Volumetric-modulated arc therapy for stereotactic body radiotherapy of lung tumors: A comparison with intensity-modulated radiotherapy techniques. Int J Radiat Oncol Biol Phys 2011;81:1560-7. Narayanasamy G, Granatowicz D, Baacke D, Li Y, Gutierrez A, Papanikolaou N, et al. A comparison between three-dimensional conformal radiotherapy, intensity-modulated radiotherapy, and volumetric-modulated arc therapy techniques for stereotactic body radiotherapy of lung tumors. Int J Med Phys Clin Eng Radiat Oncol 2015;4:104. Verbakel WF, Senan S, Cuijpers JP, Slotman BJ, Lagerwaard FJ. Rapid delivery of stereotactic radiotherapy for peripheral lung tumors using volumetric intensity-modulated arcs. Radiother Oncol 2009;93:122-4. Jiang X, Li T, Liu Y, Zhou L, Xu Y, Zhou X, et al. Planning analysis for locally advanced lung cancer: Dosimetric and efficiency comparisons between intensity-modulated radiotherapy (IMRT), single-arc/partial-arc volumetric modulated arc therapy (SA/PA-VMAT). Radiat Oncol 2011;6:140. Ong CL, Verbakel WF, Cuijpers JP, Slotman BJ, Lagerwaard FJ, Senan S, et al. Stereotactic radiotherapy for peripheral lung tumors: A comparison of volumetric modulated arc therapy with 3 other delivery techniques. Radiother Oncol 2010;97:437-42. Videtic GM, Stephans K, Reddy C, Gajdos S, Kolar M, Clouser E, et al. Intensity-modulated radiotherapy-based stereotactic body radiotherapy for medically inoperable early-stage lung cancer: Excellent local control. Int J Radiat Oncol Biol Phys 2010;77:344-9. Zhang Q, Zheng D, Lei Y, Morgan B, Driewer J, Zhang M, et al. A new variable for SRS plan quality evaluation based on normal tissue sparing: The effect of prescription isodose levels. Br J Radiol 2014;87:20140362. Prescribing, Recording, and Reporting Photon-Beam Intensity Modulated Radiotherapy (IMRT) Oxford: Oxford University Press, International Commission on Radiation Units and Measurements; 2010. Timmerman R, Galvin J, Michalski J, Straube W, Ibbott G, Martin E, et al. Accreditation and quality assurance for radiation therapy oncology group: Multicenter clinical trials using stereotactic body radiation therapy in lung cancer. Acta Oncol 2006;45:779-86. Papiez L, Timmerman R, DesRosiers C, Randall M. Extracranial stereotactic radioablation: Physical principles. Acta Oncol 2003;42:882-94. R Development Core Team, R: A Language and Environment for Statistical Computing. Vienna, Austria: R Foundation for Statistical Computing; 2008. Radiation Therapy Oncology Group. RTOG 0813: Seamless Phase I/II Study of Stereotactic Lung Radiotherapy (SBRT) for Early Stage, Centrally Located, Non-Small Cell Lung Cancer (NSCLC) in Medically Inoperable Patients. Available from: http://www.rtog.org/ClinicalTrials/ProtocolTable/StudyDetails.aspx?study=0813. [Last updated on 2015 Aug 06; Last accessed on 2016 Mar 05]. Videtic GM, Hu C, Singh AK, Chang JY, Parker W, Olivier KR, et al. NRG Oncology RTOG 0915 (NCCTG N0927): A Randomized Phase II Study Comparing 2 Stereotactic Body Radiation Therapy (SBRT) Schedules for Medically Inoperable Patients with Stage I Peripheral Non-Small Cell Lung Cancer; 2015. Available from: https://www.rtog.org/ClinicalTrials/ProtocolTable/StudyDetails.aspx?study=0915. [Last updated on 2014 Jun 03; Last accessed on 2016 Mar 05]. Hurkmans CW, Cuijpers JP, Lagerwaard FJ, Widder J, van der Heide UA, Schuring D, et al. Recommendations for implementing stereotactic radiotherapy in peripheral stage IA non-small cell lung cancer: Report from the quality assurance working party of the randomised phase III ROSEL study. Radiat Oncol 2009;4:1. Lim DH, Yi BY, Mirmiran A, Dhople A, Suntharalingam M, D'Souza WD, et al. Optimal beam arrangement for stereotactic body radiation therapy delivery in lung tumors. Acta Oncol 2010;49:219-24. Zhang GG, Ku L, Dilling TJ, Stevens CW, Zhang RR, Li W, et al. Volumetric modulated arc planning for lung stereotactic body radiotherapy using conventional and unflattened photon beams: A dosimetric comparison with 3D technique. Radiat Oncol 2011;6:152. Dong P, Lee P, Ruan D, Long T, Romeijn E, Low DA, et al. 4π noncoplanar stereotactic body radiation therapy for centrally located or larger lung tumors. Int J Radiat Oncol Biol Phys 2013;86:407-13.
de Pooter JA, Méndez Romero A, Wunderink W, Storchi PR, Heijmen BJ. Automated non-coplanar beam direction optimization improves IMRT in SBRT of liver metastasis. Radiother Oncol 2008;88:376-81. Allen AM, Czerminska M, Jänne PA, Sugarbaker DJ, Bueno R, Harris JR, et al. Fatal pneumonitis associated with intensity-modulated radiation therapy for mesothelioma. Int J Radiat Oncol Biol Phys 2006;65:640-5. Navarria P, Ascolese AM, Mancosu P, Alongi F, Clerici E, Tozzi A, et al. Volumetric modulated arc therapy with flattening filter free (FFF) beams for stereotactic body radiation therapy (SBRT) in patients with medically inoperable early stage non small cell lung cancer (NSCLC). Radiother Oncol 2013;107:414-8.